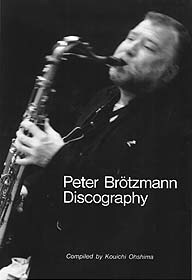 Fifty-four page gloss-paperback book listing all Brötzmann's recordings in chronological order, with full musician and track listings and greyscale image of each cover, two records/CDs per page. Cover photograph (reproduced above) by Noboru Ikushima. Manuscript was completed on 26 March 1997 and the discography published in 1997 by Improvised Company, 7-13-11 Minami-Koiwa, Edogawa, Tokyo, 133-0056, Japan. First edition was limited to 200 copies. There is no ISBN.